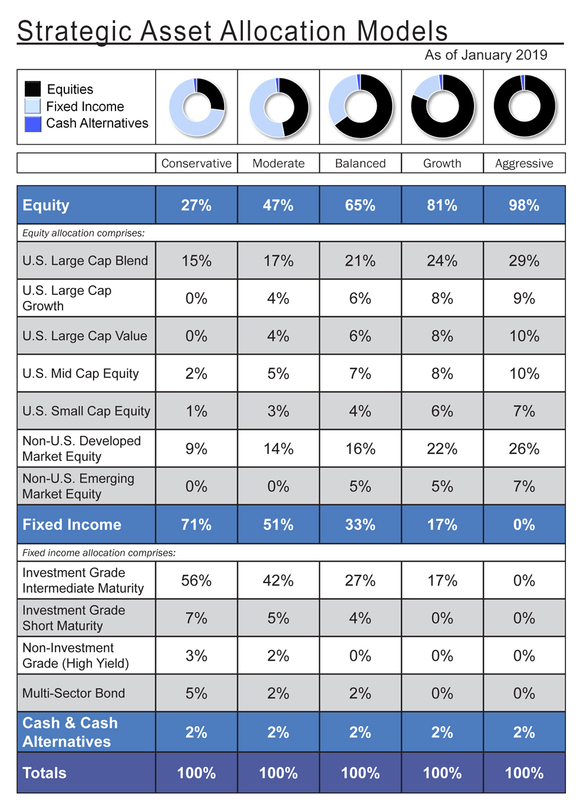 These asset allocation targets are based on our changing views of the risk and return in the various asset classes, looking out over three or more years. The models assume fully allocated portfolios and do not take into account outside assets, additional cash reserves held independent of these models, or any actual investor’s unique circumstances. Investors should consult their financial advisor to decide how these models might assist in the development of their individual portfolios. Material is provided for informational purposes only and does not constitute a recommendation. The investment profile is hypothetical, and the asset allocations are presented only as examples and are not intended as investment advice. Asset allocation and diversification do not assure a profit or protect against loss. Investing involves risk and investors may incur a profit or a loss, including the loss of all principal. International investing involves special risks, including currency fluctuations, differing financial accounting standards, and possible political and economic volatility. Investing in small- and mid-cap stocks generally involves greater risks, and therefore may not be appropriate for every investor. There is an inverse relationship between interest rate movements and fixed income prices. Generally, when interest rates rise, fixed income prices fall and when interest rates fall, fixed income prices generally rise. High-yield bonds are not suitable for all investors. When appropriate, these bonds should only comprise a modest portion of your portfolio. Commodities and currencies are generally considered speculative because of the significant potential for investment loss. They are volatile investments and should only form a small part of a diversified portfolio. Real estate investments can be subject to different and greater risks than more diversified investments. Declines in the value of real estate, economic conditions, property taxes, tax laws and interest rates all present potential risks to real estate investments.